After auto sales in the US hit record highs in 2015 thanks to the demand for trucks and SUVs, 2016 saw much tougher trading conditions. Auto sales fell for three consecutive quarters according to a Forbes report, mostly due to falling demand for cars while SUVs and truck sales remained steady. This report looks at how 17 select auto companies have sought to boost sales via social media, and identifies the key trends that came out of 2016. 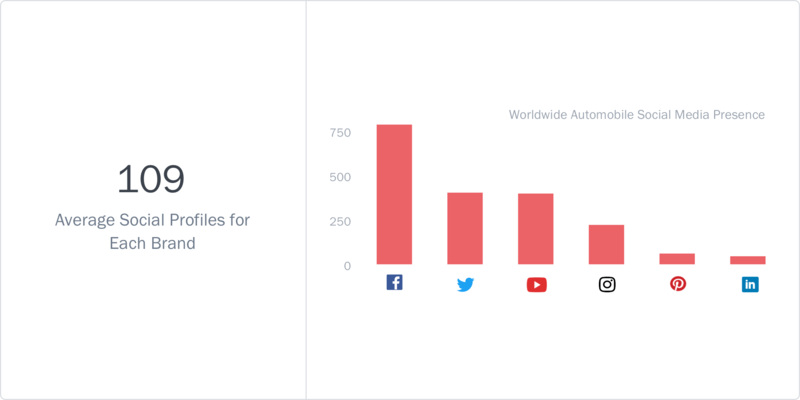 The 17 auto companies analyzed in this report were found to each have an average of 109 social media profiles globally across Facebook, Twitter, Instagram, YouTube, Pinterest & LinkedIn. Facebook is still the most preferred social channel for auto companies with almost twice the number of profiles compared to Twitter and YouTube. Instagram continues to lag behind in terms of adoption despite the higher engagement opportunities the platform offers. The number of social media profiles managed by an auto company could be on the decline. In the past, auto manufacturers have segregated their social media presence by vehicle category. However, starting with Volkswagen USA in 2014, many companies that had created separate social media profiles for their various vehicle models began consolidating their pages into their main parent company page. Ford, Kia, Chevrolet and Nissan have since merged most or all of their model pages into the main parent page. Honda USA remains the only auto company to actively maintain a social media presence by vehicle model. The table below shows the decline in the number of US-based Facebook pages maintained by auto companies over the last three years. When a brand’s Facebook pages are merged, the fans of the individual pages are shifted to the merged page, causing an exceptional spike in fans. This happened with Chevrolet and Ford in 2016, and resulted in a significantly skewed growth rate of 58% for the combined company pages. Removing these two pages from the calculation reveals an 11% growth rate which is more in line with what the other vehicle pages are experiencing. 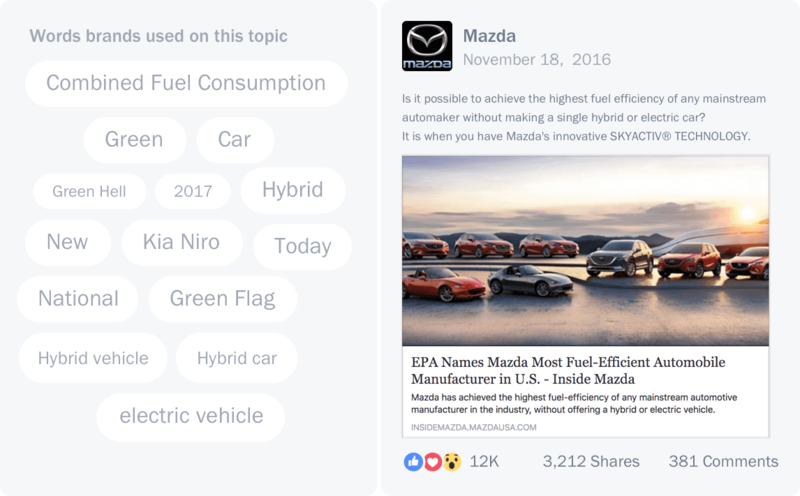 Using Unmetric Discover, a searchable database of over 500,000,000 pieces of brand content, the following topics were found to be the most popular talking points for auto companies. 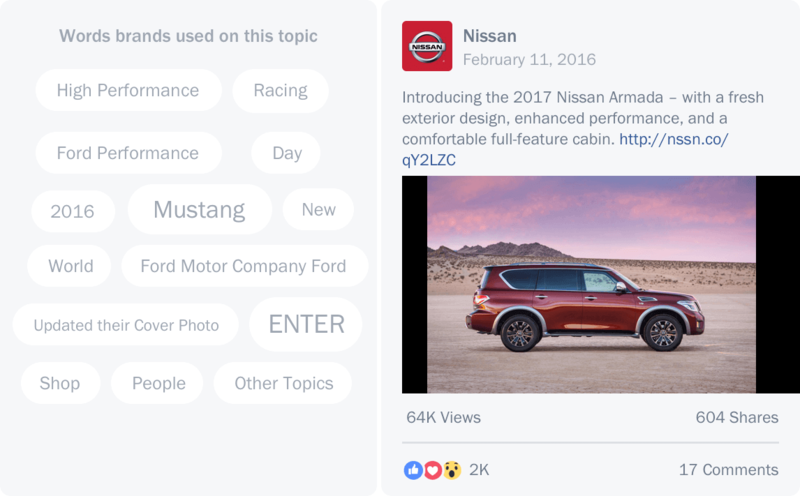 Nissan’s promoted Post about its new Armada SUV was the most shared piece of content around performance. This topic was dominated by sports and luxury brands. 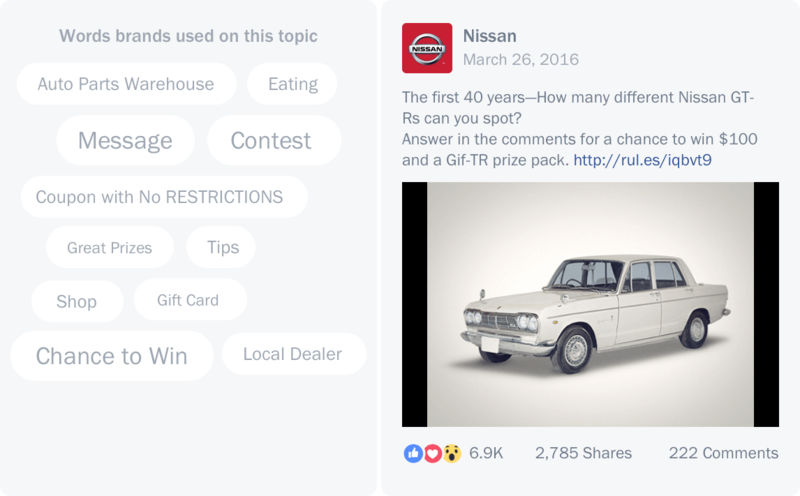 Nissan’s promoted Post asked people to guess how many GT-R cars were featured in an animated GIF to win $100. All types of auto brands from manufacturers and tires to used-car listings and car accessory brands ran promotional offers. Other popular topics that the auto industry spent a lot of time talking about in 2016 include off-roading, safety, vintage & classic cars and test drives. 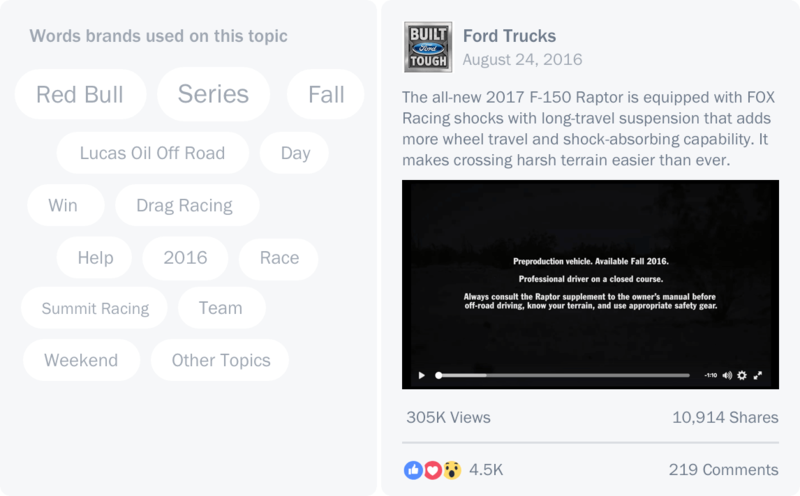 Ford Trucks’ video demonstrating the durability of the FOX Racing shocks was the most shared piece of content from the 17 brands analyzed around this topic. Plenty of manufacturers highlighted their hybrid technology cars but Mazda highlighted the exceptional fuel efficiency of their traditional engines. Top performing content was dominated by sports vehicles promoting hybrid technology. 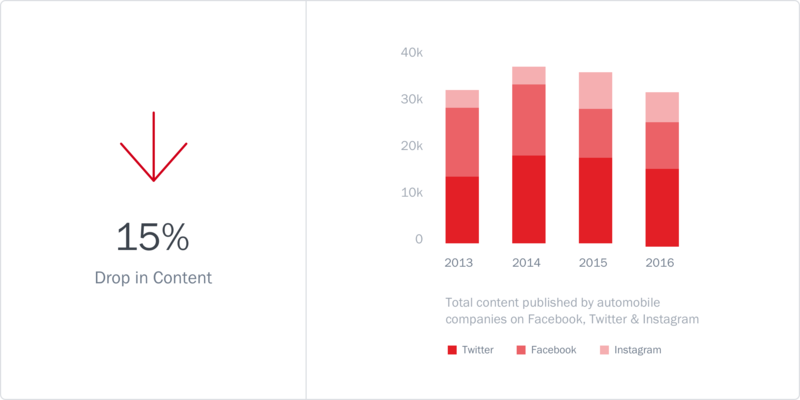 In 2016, there was a decline in the volume of social media content auto companies published on Facebook & Twitter. However we can’t rule out a rise in ‘dark posts’ that do not appear on the public timeline. 44% more content was posted on Instagram in 2016 compared to 2014 but this wasn’t enough to offset the total decline. 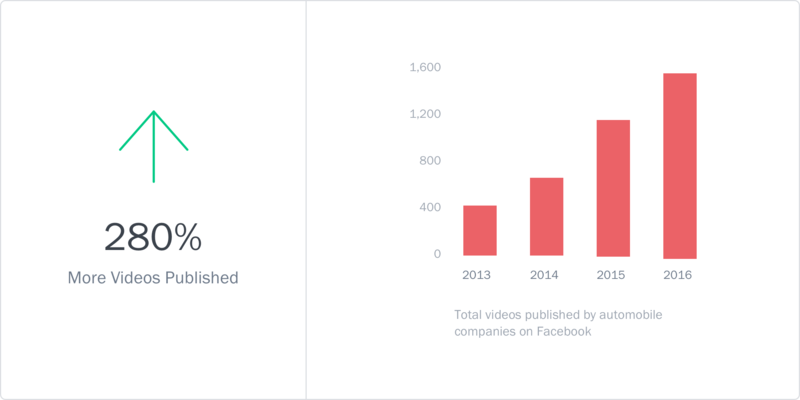 Video content on social media has been unstoppable with brands posting an average of 95 videos each to their company Facebook page in 2016. Photos are still the preferred content type but now 1 in 5 posts is a video compared to 1 in 33 in 2013. 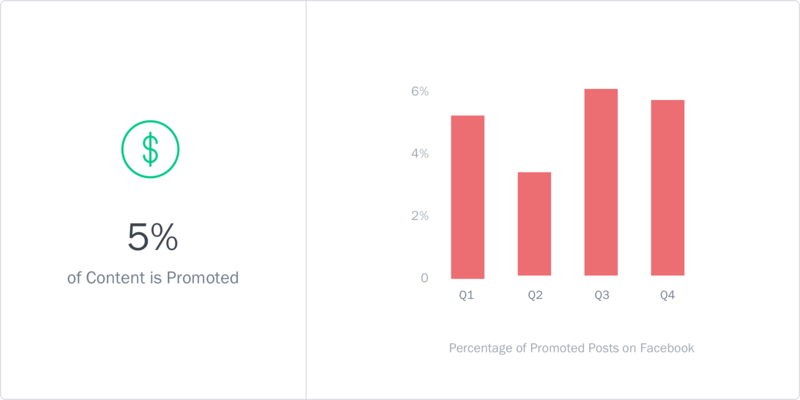 Surprisingly, given the low organic reach of Facebook page content, the rate at which brands are promoting public content on Facebook did not increase during 2016. Analysis of other industries has shown that they promote a higher percentage of posts compared to the auto industry. Note that this analysis does not take into account ‘dark post’ promotions which do not appear on the public timeline. 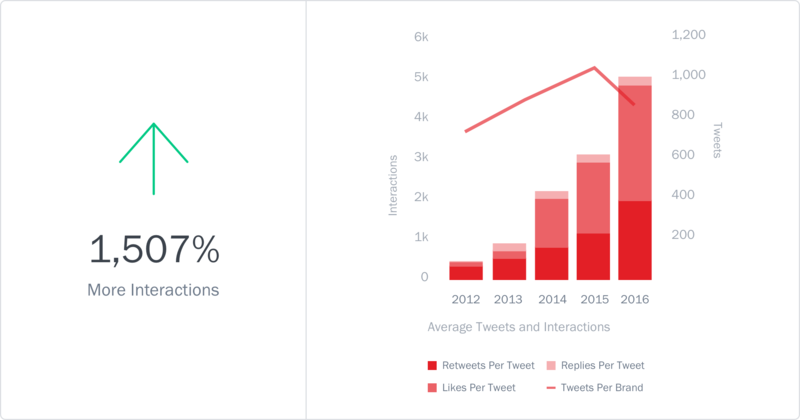 Even though the amount of content published by auto companies on Twitter fell to levels seen in 2013, the number of interactions on each tweet has grown significantly. This growth has been primarily driven by more ‘Likes’ (formerly known as Favorites) on the content and, to a lesser degree, more Retweets. 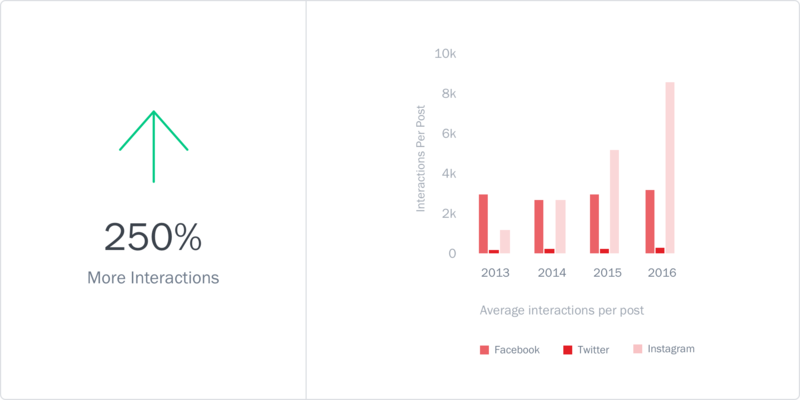 In 2014, Instagram equalled Facebook in terms of interactions per post for US auto brands. In 2016, Instagram generated 2.5 times the interactions per post than Facebook and Twitter combined. Any brand that is not leveraging the potential of Instagram right now is losing out.